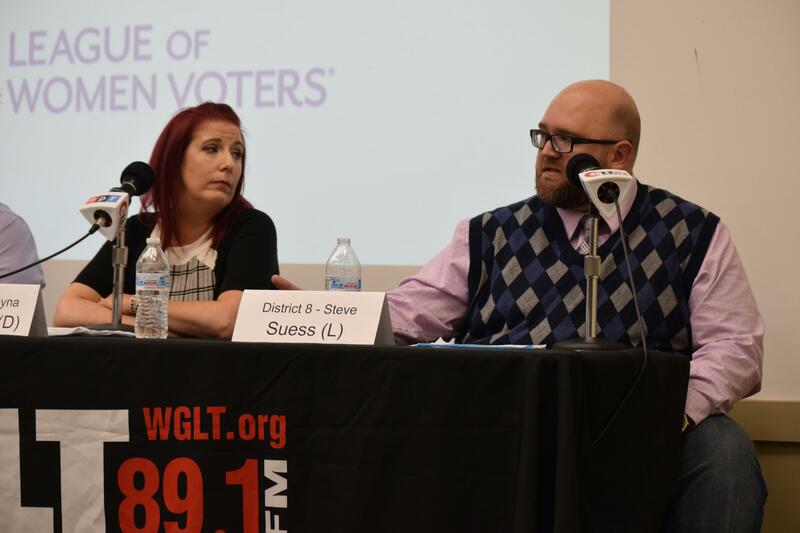 GLT and the League of Women Voters hosted the candidates for McLean County Board Districts 2, 8, and 9 Tuesday, Oct. 23, 2018. The question of what office should oversee local elections divided candidates Tuesday at GLT’s McLean County Board forum for Districts 2, 8, and 9. Bloomington voters will face a ballot question Nov. 6, asking whether they want to dissolve the Bloomington Election Commission (BEC). That would fold its duties into the McLean County clerk's office, which already administers elections for the rest of the county. Democrat Shayna Watchinski is a candidate in District 8, which covers much of downtown and west Bloomington. She spoke Tuesday about the tradition of the BEC as a nonpartisan entity, and dismissed the idea of merging the office into the county clerk’s office. “There is no plan for how they will fold a 75 percent increase in workload into a partisan office that already struggles to meet their obligations on fewer and fewer resources,” Watchinski said. Watchinski defeated Democratic County Board member Paul Segobiano in the March primary. Democrat Shayna Watchinski and Libertarian Steve Suess are running in McLean County Board District 8. Watchinski said she would, however, support a countywide election commission, but emphasized that is not the matter being voted on Nov. 6. Libertarian District 8 candidate Steve Suess said he sees both sides of the issue. On one hand, he said as a Libertarian he sees the value in having an independent election commission. But he said he questions if those commissioners could truly be nonpartisan if they were appointed by partisan judges. “Either one of those two choices (BEC duties absorbed into county clerk or a new commission) is better than the system that we have now, where we have two separate election authorities,” Suess said. "The only way to get to a countywide independent commission, without passing laws in Springfield, is to first get rid of the BEC." District 9 Republican candidate Lyndsay Bloomfield said she would also vote yes to the BEC referendum. Bloomfield called it a "common sense" move aimed at making government smaller. District 9 includes south Bloomington. Democrat Erik Rankin is not seeking re-election to that seat. The candidates also discussed the County Board's Tuesday morning meeting time. Critics say that makes it hard for residents to attend and have their voices heard. All Democratic candidates at Tuesday's forum agreed: Meetings need to be moved to the evening. Democrat David Siebert, left, and Republican incumbent Jim Soeldner are running in District 2 in southeastern McLean County. 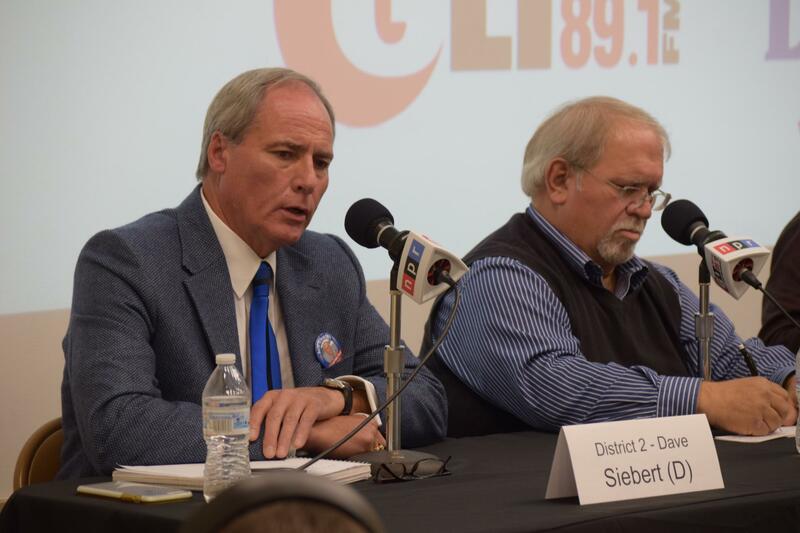 David Siebert is the Democratic candidate for District 2, which includes southeastern McLean County. He said the county is the only local government entity that holds meetings in the morning. Most city councils and village boards meet at night. District 2 incumbent Republican Jim Soeldner said he doesn't want to change meeting times. He pointed out that evening meetings are too late for rural residents who would have to travel into Bloomington and potentially drive home in the dark. “It’s just an issue to me that making it convenient for people is one thing, but we also want to make it safe for people,” Soeldner said. He also noted the County Board is now live streaming its monthly meetings. Bloomfield agreed with Soeldner. She said she will only support a change in meeting times if there is a sunset clause in place, so that meeting times would revert back to mornings if public attendance does not increase. She said meeting times were changed in the past without any impact. Watchinski disagreed. She said there is a misconception that people do not care about county government, but that is only because they can’t easily access it. People want to be more involved, she said, but they cannot make it to County Board meetings scheduled during regular working hours. Watchinski said she believes changing the meeting time will allow for more diverse views to be heard in county government. Suess, her Libertarian opponent, agreed, saying transparent government is the best government. Sol Roberts-Lieb, Libertarian candidate for District 9, said it’s time the county limits its scope. “Wherever we can, we need to look at those duplications. A nursing home, that’s great. Is that the county’s role? I don’t believe that’s the county’s role,” Roberts-Lieb said. From left, Democrat David Parker, Republican Lyndsay Bloomfield, and Libertarian Sol Roberts-Lieb are running in District 9, covering south Bloomington. Bloomfield also pushed for the need to minimize the role of government. “We cannot tax and spend our way to prosperity. That is the simple truth. I believe in fair and simple taxes for growth,” Bloomfield said. Also running in south Bloomington's District 9 is David Parker. He said he'd like to see the county expand some services, but said the state’s budget crisis tied the county's hands. Soeldner, the incumbent from District 2, said the county’s primary role is to take care of its residents. He gave examples like making sure the sheriff's department is keeping people safe and the health department is accurately inspecting restaurants. He said he could not think of one thing to change right now regarding the role of county government. He said he is happy to report McLean County has kept taxes low. Regarding the use of tax breaks for luring businesses into the county, Parker said he'd only support it in certain cases, like manufacturing and other big job creators. He said he's less inclined to support tax incentives for retail and restaurants, like the Town of Normal's tax breaks for Portillo's. "We need to sell prospective employers on what we have to offer beyond tax breaks," Parker said. Suess, the Libertarian running in District 8, agreed. “We can do better than that," Suess said, calling tax abatements unfair to others who pay taxes. District 8 Republican candidate Cheryl Froelich and District 2 Libertarian Paul Michael Enerson did not attend the forum. 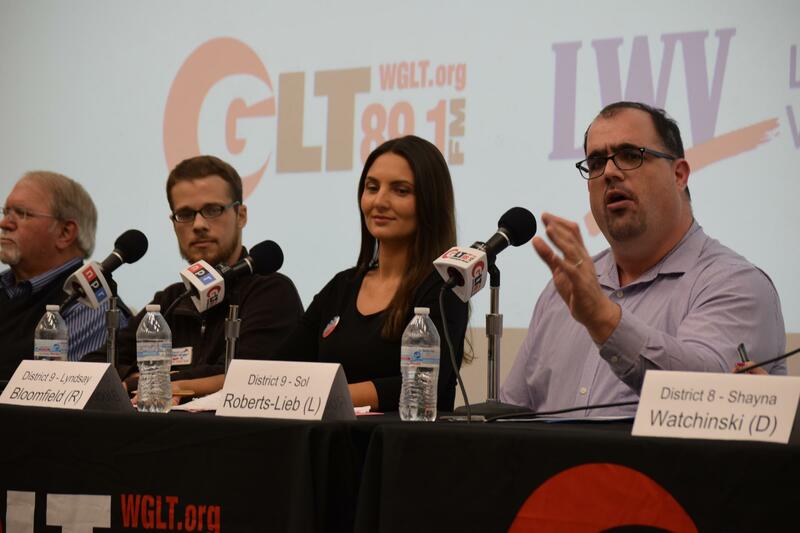 The next GLT-League of Women Voters debate is Oct. 29 with candidates for the 13th Congressional District: Democrat Betsy Dirksen Londrigan and incumbent Rep. Rodney Davis. McLean County Republicans are fielding a candidate against the Democratic challenger who knocked off longtime County Board member Paul Segobiano in March’s primary. McLean County has become fertile ground for developers seeking to build wind and solar farms. That’s created a quandary for some County Board members who argue the county’s comprehensive plan doesn’t account for renewable energy. UPDATED 11:20 a.m. | Former McLean County Board chairman Matt Sorensen is expected to be released from federal custody this month after serving his one-year sentence for defrauding State Farm and one of its consultants.